SAN JOSE, CA – DECEMBER 13, 2016 – mCube, provider of the world’s smallest MEMS motion sensors, today announced the sampling of its new MC3672 3-axis accelerometer featuring the industry’s lowest power consumption and a microscopic 1.1×1.3 mm Chip Scale Package (CSP) package. The MC3672 will enable developers to design a complete 3-axis inertial solution, with only a single resistor, in less than 8 square millimeters of space on a printed circuit board. These advancements will enable a new generation of wearable, Internet of Moving Things (IoMT) devices, that require significantly extended battery life and very small form factors. The ultra-thin profile of 0.7 mm and small footprint will enable designers to integrate inertial sensing into the next generation of wearables, hearing aids, and medical devices. As the newest member of mCube’s MC3600 family of ultra-low power, high-performance 3-axis accelerometers, the MC3672 is built upon the company’s award-winning 3D monolithic single-chip MEMS technology platform, which is widely adopted in mobile handsets with over 200 million units shipped. 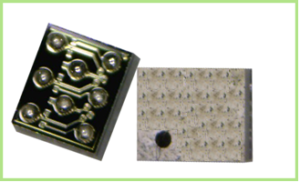 With the mCube approach, the MEMS sensors are fabricated directly on top of IC electronics in a standard CMOS fabrication facility. Advantages of this monolithic approach include smaller size, higher performance, lower cost, and the ability to integrate multiple sensors onto a single chip. “The MC3672 delivers the unique combination of ultra-low power consumption and a microscopic form factor that will enable designers to create fashionable wearable devices and advanced health monitoring products,” said Ben Lee, mCube CEO. “mCube continues to meet our commitment to provide leading edge inertial sensing solutions that will keep pace with the rapid design cycles of innovative IoT and medical devices”. The MC3672 accelerometer is an integrated digital output 3-axis accelerometer with a feature set that is optimized for wearables and IoT devices. This ultra-low power, low-noise accelerometer consumes less than 0.9uA of current at 25Hz Output Data Rate (ODR), which is less than half the power consumption of competing accelerometers. In order to further reduce system power consumption, it offers an ultra-low power sniff mode that consumes only 0.4uA of current at 6Hz ODR with a 32 sample FIFO. The sniff mode is ideal for wearables during periods of rest or inactivity. In addition to ultra-low power modes, the MC3672 has been optimized by increasing its Serial Peripheral Interface (SPI) bus speed and reducing the number of transactions per SPI transfer, both of which further extends the battery life of systems. General sampling of the world’s smallest 1.1 x 1.3 x 0.7 mm CSP accelerometers are available to customers now through franchised mCube distributors. Volume production is scheduled for the first quarter of 2017. In order to enable rapid prototyping, mCube will also offer the EV3672A, an 8-pin dual-in-line evaluation board with the MC3672 device mounted on a mini PCB. This evaluation board will provide the means for engineers to quickly evaluate and design-in the MC3672 using a standard breadboard. 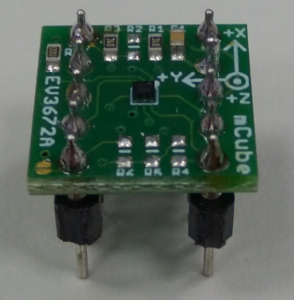 The EV3672A is available today through franchised mCube distributors. Copyright 2016. All rights reserved. mCube, Inc., the mCube logo, and certain other mCube trademarks and logos are trademarks and/or registered trademarks of mCube, Inc.